The social history of music in Britain since 1950 has long been the subject of nostalgic articles in newspapers and magazines, nostalgic programmes on radio and television and collective memories on music websites, but to date there has been no proper scholarly study. 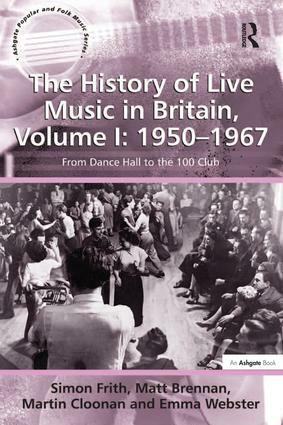 The three volumes of The History of Live Music in Britain address this gap, and do so from the unique perspective of the music promoter: the key theme is the changing nature of the live music industry. The books are focused upon popular music but cover all musical genres and the authors offer new insights into a variety of issues, including changes in musical fashions and tastes; the impact of developing technologies; the balance of power between live and recorded music businesses; the role of the state as regulator and promoter; the effects of demographic and other social changes on music culture; and the continuing importance of do-it-yourself enthusiasts. Drawing on archival research, a wide range of academic and non-academic secondary sources, participant observation and industry interviews, the books are likely to become landmark works within Popular Music Studies and broader cultural history. Contents: Preface; Getting back to business; Live music and the state; A snapshot of Bristol in October-November 1962; Being a musician; Do-it-yourself! ; A snapshot of Glasgow in October-November 1962; Youth; The recording industry; A snapshot of Sheffield in October-November 1962; Venues, audience and promoters; The Rolling Stones, Richmond 1963; Bibliography; Index. Simon Frith is Tovey Professor of Music at the University of Edinburgh. His work is collected in Taking Popular Music Seriously (Ashgate 2007) and, with Simon Zagorski-Thomas, he edited The Art of Record Production (Ashgate 2012). He chairs the judges of the Mercury Music Prize and is a fellow of the British Academy. Matt Brennan is the Chancellor’s Fellow of Music at the University of Edinburgh. He specialises in popular music studies combining historical, sociological, and business perspectives. His work has previously appeared in the journals Popular Music, Popular Music History, and Jazz Research Journal. Martin Cloonan is Professor of Popular Music Politics at the University of Glasgow. His research interests cover all areas of music and politics including censorship, regulation and music policy. Previous books include Popular Music and The State in the UK (Ashgate, 2007) and Dark Side of The Tune: Popular Music and Violence (Ashgate, 2008). Emma Webster received her PhD from the University of Glasgow in November 2011; her thesis was concerned with live music promotion. Before returning to academia, she worked for a number of years in music and theatre in a variety of roles and genres including opera, ’world’ music, and acid techno.